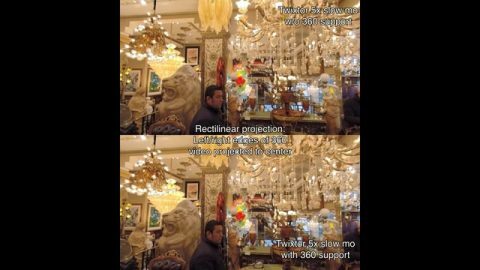 Twixtor uses optical flow tracking on 360 footage taking into account the connectedness of the left and right sides of the 360 video, as well as the top and bottom. Twixtor slow motion in action! RE:Vision Effects’ Twixtor used to retime up to 160x slower than real time. Camera: Shot on Red Epic at 120fps. Beautiful viral video by Oton Bacar 7D slow motion test footage of his friend doing bmx tricks. "Twixtor represents a new touchstone in retiming. The difference in accuracy means that retiming artifacts are either drastically reduced or disappear on the hardest to retime footage. " "amazing" and "a must-have for any toolkit." "I've tried other solutions - including Pixel Motion and Timewarp in After Effects 7 - and I have to say that Twixtor still consistently gives me the smoothest speed-shifted footage with the least amount of sweat, hands-down." "I highly recommend this plugin to those seeking absolute superiority in time frame manipulation." "it's the best plug-in method for creating speed changes, slow-motion effects, and frame-rate conversions." "If you regularly find yourself stretching or shrinking footage to fit a target duration, or creating extreme speed control special effects, this is a plugin that you'll find invaluable." Twixtor is more accurate and exhibits fewer artifacts when there are objects crossing in the scene. This means less tearing and stretching of objects as they cross or go out of the frame. Retime using a single speed setting. Option to control retiming on frame-by-frame basis is always available! In order to achieve unparalleled image quality we developed proprietary tracking technology that calculates motion for each individual pixel, enabling Twixtor to synthesize unique new frames by warping and interpolating frames of the original sequence.